I provide students of all ages with individual and group music tuition. My aim is to give kids and adults the right tools to have fun making music, explore their abilities to learn new skills, and experience the resulting sense of achievement and confidence. You will be surprised at the fast progress you can achieve with the right tutor. I specialise in a professional and personalised approach to lessons, in line with the goals that each student has for their musical journey. Your first lesson will include talking about your musical goals, so that I can provide tutoring that will take you to those levels and beyond. 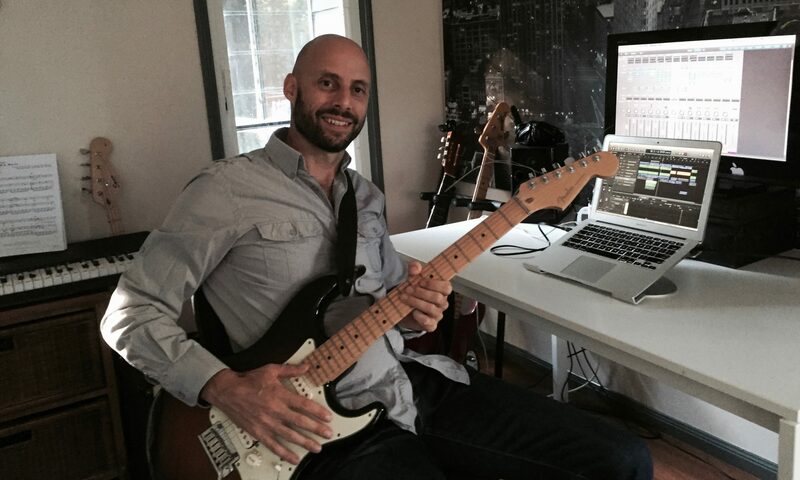 The fastest way to progress in guitar or bass is to practice at home, building the muscle (including brain) memory – so I include tunes that the student loves. They can’t wait to practice at home and play the songs to their family and friends. I hold AMEB Contemporary Guitar and Music Theory qualifications and am currently studying a Bachelor of Music Performance. I am a registered AMEB enroller. Those students that want to complete AMEB and Rockschool exams are coached and prepared to achieve excellent results. All students from the age of 7 upwards are welcome. Guitar is such a versatile and rewarding instrument, and I am passionate about partnering you from your first notes and chords all the way to playing advanced pop, heavy rock, jazz, gypsy swing, blues, classical, folk and country. In addition to the fun factor, It’s proven that playing an instrument increases academic results, confidence, concentration and social skills. It is great for kids to learn discipline while having a creative outlet to express themselves. My lessons on acoustic, classical or electric guitar, cover a broad range of musical styles from kids’ rhymes to hard rock and jazz. I played my first live gig in 1987 and taught my first student in 1993. I am dedicated to passing on my knowledge of music theory and harmony, and love to explain why a song is constructed a certain way, and spark the curiosity in students to learn more. I also have live experience and a diploma in sound engineering, and many years of experience using Logic Pro, so can include recording and mixing lessons, as required. The bass has a unique place as the glue between rhythm and melody/harmony. It turns a bunch of musicians into a band, and you feel great bass almost as much as hear it. I love to give bass lessons so get in touch whether you are starting out or want to develop your bass playing. I teach from my studio in Diddillibah, just 10 minutes west of Maroochydore, Sunshine Coast. The learning environment is fun and supportive, with great coffee and wi-fi for waiting parents. 🙂 I possess a current QLD Blue Card. Get in touch to book or discuss your options. If you’re not entirely satisfied I offer a 100% money-back guarantee, so let’s get started! To enquire about lessons, or any other query, please send a message with the form below. Guitar lessons are held in the central Sunshine Coast suburb of Diddillibah, just 10 minutes from Maroochydore. Very close to areas such as Mooloolaba, Buderim, Kawana, Twin Waters, Bli Bli, and Nambour. Not too far from Caloundra and Noosa. Too easy!